A friend of mine is a “grill fanatic” and often volunteers to barbecue at events or for friends and family special occasions, for no charge, other than the kick he gets from doing it. 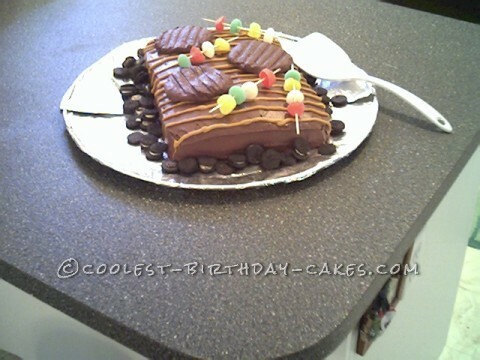 His birthday is in January and this year I made him a birthday cake in the shape of a barbecue grill. I baked two cakes in 10 x 15 cookie sheets (with sides) and put them together with icing and used a piping bag to make the wire grill marks on the top. I used fudge to make the hamburger patties and gum drops to make kabobs. I used mini Oreo’s for barbecue briquettes. I thought it was cute, but not all that great (since I’m not a professional baker). When I brought the cake in, my friend (a 50 yr. old, big strapping 6′ man) actually cried! Everyone was stunned at his reaction and pretty soon we were all reaching for hankies!